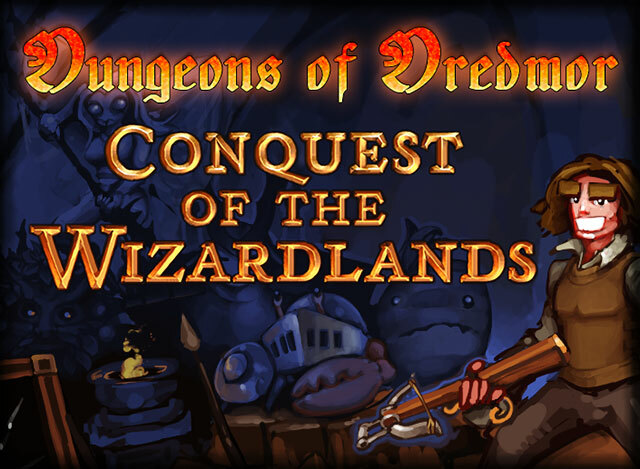 All posts tagged with "you have to conquer the wizardlands"
Gaslamp Games is pleased to announce another entry in its ongoing series of hastily-named expansion packs: Dungeons of Dredmor: Conquest of the Wizardlands. We had so much fun releasing Realm of the Diggle Gods last year* and the ridiculously under-priced You Have To Name the Expansion Pack (with Steam Workshop support) two weeks ago, that we decided to do it all again**. ** This time for real money rather than Digglebucks. Why? Because Nicholas’ voracious coffee addiction doesn’t pay for itself. For the past four months, a secret strike team of game development commandos has been secretly crafting arcane components into something for you… something about wizards. Something about their lands. Yes, this summon you must join the Conquest Of The Wizardlands. Explore the Wizardlands! Trade Wizarding Graffiti with your friends and enemies alike to gain access to the fractured extra-dimensional domains of the Wizards using an innovative retro-inspired magic password system. Harness the expanded storage space of your very own Pocket Dimension where interdimensional gnomes probably won’t steal all your crafting-junk. Encrust your Equipment with our powerful new Encrusting System! Upgrade weapons and armour with powerful crusts, offering special abilities and horrifying instability effects as crust is encrusted upon crust! Tackle new foes from the terrifyingly fun Baron Samedi to the small and annoying Cloud Gremlins who shoot small and annoying lightning bolts at you! Beware the Monstrous Rutabaga, scourge of the Vikings, who will run you down at unexpected speed with the monstrous dash ability. A whole WHACK of new Skills: Daggers, Polearms, Bankster, Communist, Paranormal Investigator, Magical Law, and more! Enhanced sneakiness, monster sight cones, and alertness levels for more roguish gameplay! The only thing missing is a box you can carry around to hide in — unless you count an extra-dimensional box (see the first item in this list). Diggle Hell. It’s a real place. How and when you ask?